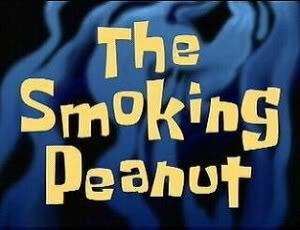 The Smoking Peanut (Episode) – From SpongePedia, the biggest SpongeBob-wiki in the world! SpongeBob and Patrick go to the Oyster Stadium to see Clamu the Clam perform tricks. Apparently, Clamu is sleeping and SpongeBob and Patrick want to see a show. When Patrick leaves because of boredom, SpongeBob tries to wake Clamu up by throwing a peanut. Clamu wakes up and goes on a rampage as she attacks people and cries. Apparently, the cry is so loud that it can be heard all over the world. Everyone is angry and annoyed and they all want to find who did the crime. Patrick starts to do some investigating to find out who did it. SpongeBob feels the grief and guilt and decides to turn himself in. A trainer of Clamu sees that Eugene H. Krabs stole Clamu's pearl which happens to be an egg (that's really why she was burping when SpongeBob threw the peanut), which means Clamu is now a mother. Mr. Krab's excuse for the crime is that it is free day at the Bikini Bottom Zoo. To be punished for his crime, Mr Krabs has peanuts thrown at him, to see how he likes it. When Patrick says "Hey SpongeBob" in the evil tone, his eyelids are pink instead of their regular purple color. A tune from Danger Mouse is used. When the zookeeper pulls Mr. Krabs' pants off, the belt buckle colors are reversed to yellow on the inside and black on the outside, although in the next scene it reversed back to normal. Clamu is a reference to the popular Shamu in Seaworld. In every other episode, Bikini Bottom has blue and white police cars (similar to NYPD's old squad car color scheme). However, in this episode the police cars are black and red. There is a book to tie-in with this episode, but called Zoo Day Disaster. Clamu and her baby are voiced by Frank Welker. When SpongeBob said, "What is this, 20 questions or something?" he is referencing the traditional car game. He also references it in the episode Missing Identity when he says "I would love to stay here and play 20 questions with you.". This page was last modified on 22 August 2010, at 12:45.